Fossil Shark Tooth Identification Guide for the Calvert Cliffs of Maryland and the Horsehead Cliffs of Virginia. 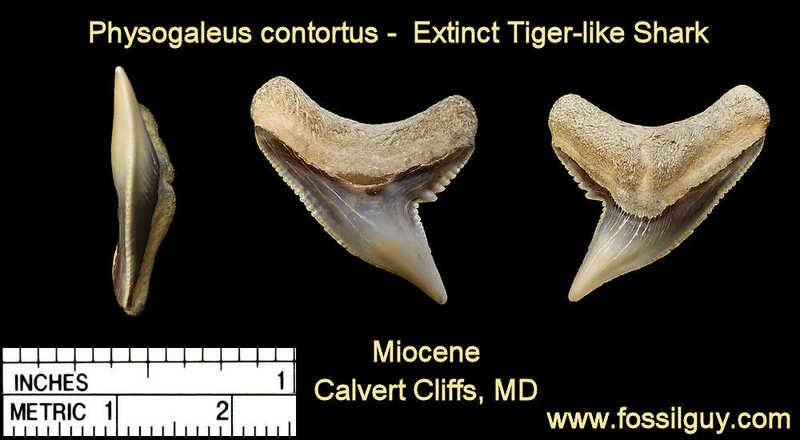 Fossil shark teeth are the most popular fossils to look for at the Calvert Cliffs. They are all from Miocene time period. One of the more sought after shark is the Megalodon shark, a giant 60 foot shark! This shark is also known as Galeocerdo contortus and Physogaleus aduncus in some paleontology circles. This is an example of a lateral P. contortus fossil shark tooth. Notice the slightly "contorted" or twisted blade. These are examples of different tooth positions of P. contortus. The first three teeth on the left are Parasymphyseal teeth or the teeth in the very front of the jaw.